ah search parameters refined. Good job M! I wish my libraries search function was that user friendly. She should have limited to languages she can read initially. Or, as FairportFan pointed out yesterday, it could be that as long as she’s in the Library, she can read anything, regardless of the language it’s written in. Hey, this is magic, not technology as we know it, remember? Actually, what i meant was that, as long as she has the key to the TARDIS … i mean, a “connection” to the Library, the Library will translate its books (or other media) for her, even if she’s not physically in the Library. An interesting question: The library is not located in this continuum, so technically it is not connected to our time stream. So the question is WHEN is the library? Does it contain books that we would perceive as written in the future, or are they locked from our access somehow to prevent paradoxes? boo-yah (lean) + love the sound effects. Now to break out the crumbly apple pie and start reading. “Chugchugchugchug … slump.” Drinking in the knowledge you mean? That’s a smaller stack than I figured it would be. She specified non-fiction. These are the technical manuals and enginerring specs for the cells and probably devices that used them. Probably not many of those were written in books. Stone walls more likely. lol. I don’t think the library collects those. Yes. You know what it’s like with google; you send it something like “Search for vimana cells, websites older than one year, in English, not involving motorcycles.” Then you get 48,443 hits, an advertisement for rechargable batteries, and a recipe for muffins. And now that you’ve mentioned it on the internet, google knows you like muffins. To Fairportfan- Over here in the corner we have Tea, cookies, and assorted pasteries. please don’t fight over the books or the food. I dunno–her stack looks pretty big to me. . . .
Oh, you meant the BOOKS! Well that narrowed things right down. “Pertaining to Earth”? There are books by/about alien Vimana Cells!? And a lot of ’em, by the look of it…. And, apparently it’s a steam powered library. Aliens, or viama cells that were used by humans in other places. If the wormholes span the galaxy, there may be other human settlements out there. It’s been 10,000 years since the Chimera’s rampage, (not counting the Calendar machine resets, they affected the whole galaxy). Wonder what any Lanthian offshoot civilizations have been up too? Maybe it’s not alien vimana cells so much as vimana cells that pertain to another dimension. I mean, if vimana cells relate to Indians (I’m assuming the country, not the Native Americans), then by narrowing the search to Earth, she could be weeding out religious texts that still would have been classified as “non-fiction”. *shrugs* Maybe. The library existed before man did. I believe Paul made a mention of something like that before. Welcome back! Monica is just adorable standing next to that stack of references. I HAVE a spare set! I lose BOTH sets, dammit! Not much worse than the stack that the average high-school senior has to haul around in her backpack these days. I wonder how many books the Library will let you check out simultaneously… whether you hit a limit, and the extras “go all dust-bunny”? Is there a two-week limit on inter- or intra-Library book loans? Seems to me that the “late fees” from this particular institution might be rather fearsome. Handy… saves having to carry them back down the street. It’d be a bummer, though, if you had left your carefully-written notes in the book, and forgot to take them out before the Library said Plugh and the books faded away again. that’s OK too.. remember that “The Library” keeps a copy of ALL things written! all you’d need to do is to check out your OWN NOTES! would Monica have access to her own writings? I mean Brandi got hers from Phixx. Love the pose in the final panel. Great strip, always. Actually I think the stack makes her look Taller. …..And Sexier! Or is that just what a week away from M and the Girls does to you? I actually had a similar thought–but I saw a croquet mallet, for some reason. With that hat? Golf, definitely. It looks to me as if she had to do a quick leg cross-over to prevent the books landing on her right foot. That or she performed a 90 degree body twist without lifting her legs. Thought so. The parser on this forum is case-sensitive. Safer to use an explicit tag, I think. Very nice work on the golf-artwork! That’s not a golfing outfit. If i’d known you wanted awful plaids, i’d have put some in. BTW – you can’t see it (you couldn’t actually see it in the original graphic i lifted it from), but that is a Hello Kitty putter. That’s a place I could happily starve to death in. I’ve often thought of heaven as a complete library, with all pristine books, and a complete restaurant/coffee bar so you don’t have to leave. Would that mean that hell is a library where every book has the spine cracked, pages ripped out, images defaced, and the words are in a language that you don’t understand? That would be a good start. Add some really cranky librarians, and obnoxious patrons–with sniffles. With the last chapter missing. Yes, the original is a gem. I once heard that, to really hurt someone, you don’t just take away what they love. You give it back to them–broken. So, Hell is a place whose entertainment system is stocked entirely with bad Hollywood remakes? Hey, God – I promise I’ll be Very Very Good! Worse. They’re all on film and it breaks every few seconds. Plus the sproket holes are worn and it jumps all the time. I’ve always assumed Hell would be personal. What scares one person doesn’t bother the another. Maybe in the ancient times being burned alive was a real and tangible danger so would be a good thing to say to relate to people. I squee when i visit a ‘waterstones’ or a decently stocked library. No – you’re thinking of the red-headed duck … you know, Daphene. Apologies if this shows up twice… I think I hit a race condition in WordPress when I posted it the first time, due to a collision with FairportFan’s comment postedcat the same moment. Hey! Whatta tryin’ to say there Dave? Ah ha! I just identified where Big Daddy got one of their arrangements from! …and a Big Daddy discography, with the sources of their arrangements appended to each song – in a sort of cryptic crossword clue style. And with what she’s saying here – looks like she has a lot of practice with/from Google. I would cheerfully give everything I own for a library card like Monica’s. If you specified “non-fiction”, I wonder how many of those books were considered fiction (or, “rantings of a crackpot loon”) by “normal people”. Super Smart Library knows whose version of (non)fiction you mean. Een Lawntees, de lybrery reads YOU! Hey, that’s just how my library works! Oh wait no, that’s just computers. Because that’s all the library is good for anymore. I mean seriously; even the people waiting to get on one of the computers don’t bother to pick up a book and read something while they wait. They’d just rather sit there and stare ahead. my library doesn’t even stock the classics any more. HG Wells is not on the shelves..
Did not check Agitha Christie but I suspect not. Haha!! Love the disembodied voice of the library. Are we sure that the Library isn’t part of Castle Heterodyne? Castle Heterodyne would have delivered the books with an armored monster, surprising trap door, or steam catapult. Or all three at once! Wyvern- I’d be more worried about how the rejected tomes were removed. Stay out of the lines of fire. I hope I wasn’t the only one who was a bit startled when the library actually responded verbally to Mon. We’ve seen the Library speak verbally in the past… in particular, it spoke to Phix and Nudge when it appointed them as co-guardians of the Library and said that they were free to come and go as they wished. It’s definitely interesting that it’s speaking to Monica directly… I don’t think we know whether all Library visitors are so privileged. The odd thing is Phix indicated that was the first time in all those thousands of years the Library spoke. Was she unaware of the search feature? Not likely. We could duplicate such a thing today had we a holodeck type device. The closest we could come now would be be to use virtual reality glasses and motion sensing. The thing lacking would be the tactile feel of the book. Someone is working on gloves that are supposed to give that sensation, however. To me, it’s just a gimick. It’s much better simply to be able to do a search on a screen. You can get right down to the word by that method. Don’t have to lug faux books around either. This method, while cool, would get old after a while. You would just get used to it and it would lose it’s dramatic effect pretty quick. Sort of like HD TV. The only good thing about it would be that it can cross cultural boundries. The book form would likely be familiar to many of different tech levels. OK, since no one else has said it – that last panel is a data dump. Don’t you know of the danger in making puns about the pun jar?! You might set up an infinite causal loop that could engulf us all! Gotta. A few months ago I was condemned to suffocate in the Pun Jar, for having committed a really terrible/good one. Generating a meta-reference pun loop, and converting the Pun Jar into a Klein bottle, was the only way out. It’s in the works. For years people have been thinking about displays, and entire pad computers, that you could fold up like an handkerchief and stuff into your pocket. It’s not quite here yet. But when it’s possible, one of the obvious formats is the book with pages that show whatever they need to (for example, A Young Lady’s Illustrated Primer). If you own an iPhone you can use google and Siri together for pretty much exactly the interface experience Monica just had. DonMartin would have given us something like: Flappita Flappita Flappita Flappita THPLAPTH. Or maybe something like FAGROONklubbleklubbleklubble, which he established as the definitive sound of a collapsing supermarket. kinda like ‘the hitchhikers guide to the internet’? i thought that season was over? the seem to be playing rugby now..
And New Zealand won the cup by beating France . Much joy in Christchurch now – took their minds off the earthquake . Is it just me – or is Paul a little tardy this morning . But can it tell us of Pan-Galactic Gargle Blasters, the planet Bethselamon, or what is the method used to make the hostess’ undergarments jump three feet to the left? Good thing she didn’t ask for all the dangerous creatures of Fourecks! sorry for any repeats. 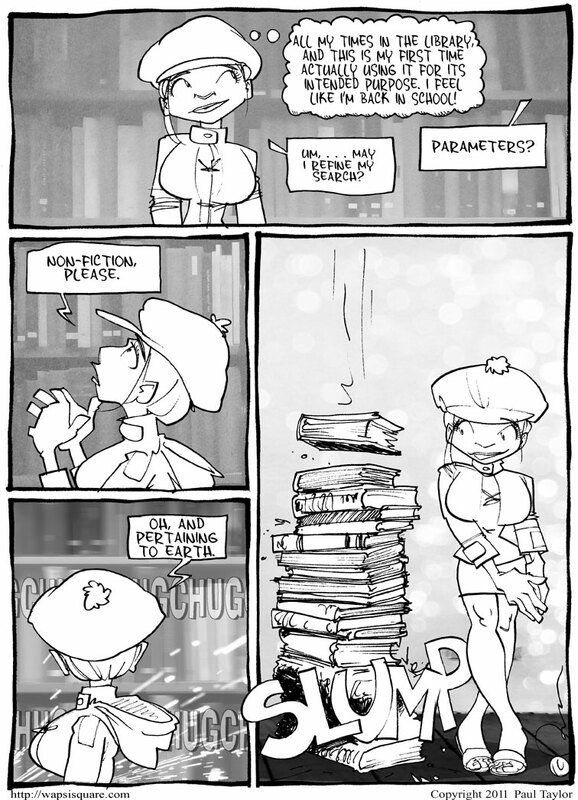 large library; parameters are nonfiction pertaining to earth, and that’s only about 20 books?